Panelists discuss various innovative business models at the Journalism Innovation Summit. Pictured (left to right) are Alex Hartman of Newzulu, Seung-yoon Lee at Byline, Matt McAlister of Contributoria, Lyra McKee of The Muckracker and Cassie Werber of Quarts. Photo by students from the University of Oklahoma. This piece was produced by a team of students from the University of Oklahoma, including Brigette Waltermire, Anna Reisman, Nicholas Masopust, Ali Stratton, Erin Donnelly, Hayley Jamil, M’ary Miller, Lydia Farve and Candace Hinnergardt. Panelists at the first annual Journalism Innovation Summit in London earlier this month, hosted by City University London and produced by PBS MediaShift, were posed with two thorny questions facing the media industry: how can you push innovative content, and how can you create business models through audience engagement? Below we round up some of the highlights of the two panel discussions. The morning panel on innovative content brought to the stage moderator Nathalie Malinarich of BBC, along with panelists Malachy Browne, Reported.ly; Björn Rosenthal, Deutsche Welle; Ann Gripper, Trinity Mirror; and Nate Lanxon, Bloomberg Media. They started the conversation by discussing how to ensure publishers can effectively reach their audience. Browne said that Reported.ly, a division of First Look Media, had been trying to find a way to stand out on social media platforms, such as Twitter, without getting lost in the noise. By making social posts their main place for content (they are just launching a website and had used Medium previously), Reported.ly has been able to gain an edge on social media as breaking news happens. “Finding the best journalism and bringing that into our own… the rest falls into place,” he said. However, it’s not an easy task building a social-first news operation. “To optimize your engagement on a number of different social platforms … that’ll be another challenge that we have,” Browne said. It can be challenging for journalists to redefine what needs to go into a story and how they construct it. Trinity Mirror’s Gripper said news and pictures are not enough. Her company has delved into the use of interactive graphics to get people involved with their content. She does not necessarily find the old ways more effective than the new approaches happening throughout the industry. Traditional stories and interactive online aspects “have both got their place,” she said. One of the biggest challenges for legacy media is getting the attention of the millennials. The best way to catch their eye, according to both Gripper and Lanxon, is through social media. Now, the background of its audience has changed from savvy insiders to include those who want to understand how business and technology work. “Different ways of packaging news stories can make the difference between being incredibly successful and being a complete failure,” he said. Deutsche Welle’s Rosenthal has been helping the German public media outlet connect with a new audience with an app that also asks for input from the audience. To find content, they cannot sit back and ask people to download an app and then create the news – they have to keep it interesting. “The most important thing with an app is that they have to be in control, and the app has to behave in a very native way,” Rosenthal said. To Gripper and Lanxon, a lot of thought and research goes into the production of content before creating different platforms for engagement. Gripper said that Mirror Online had to make sure their advertisers were ready for the shift before launching a new type of content. Lanxon found that the approach of thinking it through is important. He said the company knows when their readers begin reading their content and what the peak hours are for posting online content (usually 7 to 9 a.m.). To hold the attention of these under-caffeinated, sleepy-eyed audiences, according to Lanxon, the key is to treat all video like a YouTube ad: If their interest is not caught in the first five seconds, they will click skip. Optimizing content is an essential part of storytelling. Gripper said journalists should think about the final presentation because it determines how they write out or present a piece of media. Online presentation and length is completely different from print journalism. It is no longer as easy as finding the story and putting it into the paper. Now, one must organize and monitor their stories to know how a story affects each area of the web, Browne said. “It’s about formatting those stories in the best way for the different mediums that we’re publishing across,” said Browne. In the afternoon panel, moderator Cassie Werber of Quartz led a discussion with panelists Lyra McKee of The Muckracker, Seung-yoon Lee of Byline, Matt McAlister of Contributoria, and Alex Hartman of Newzulu. They discussed how journalists can make money through audience engagement and crowdfunding. Many of their ideas centered around freelance and citizen journalism. McAlister, the co-founder of Contributoria, discussed how his service (a division of The Guardian) enables journalists and writers to collaborate on all aspects of the writing process with the audience, and eventually publish the work via crowdfunding. During the panel, McAlister said there are more than 4,000 writers in Contributoria’s network. Through this network, journalists get feedback on their work from their peers, allowing it to go through a public feedback process before the piece goes live. Contributoria thrives off of the idea of crowdfunding, a concept McAlister and the other panelists say can help support a brighter future for independent journalism. In addition to running Contributoria, McAlister works for the Guardian Media Group in an effort to develop new businesses. With the idea of crowdfunding already in the air, Seung-yoon Lee took his turn on the panel to introduce his business called Byline, of which he is the CEO and co-founder. Byline is a crowdfunded independent journalism service that launched just a month ago. This model empowers readers by letting them fund their favorite writers directly. “Newspapers haven’t found the best business model in the digital age,” Lee said, explaining that the advertising-driven model is breaking down. The model that Byline has adapted is most beneficial for niche content — the type of content that readers would pay a premium for. The ultimate goal of Byline is to match the supply to the demand and allow journalists to pitch their stories directly to readers. 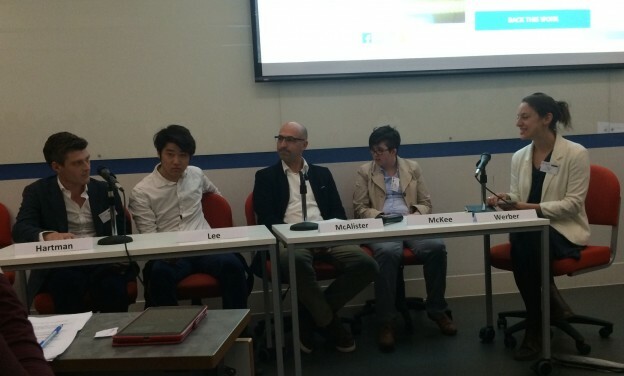 “We don’t want to be a crowdfunding platform for journalism; we want to be a crowdfunding outlet for media,” Lee said. Lee is also currently a contributing editor to the WorldPost and was the first East Asian President of the Oxford Union, the world’s most prestigious debating society. Hartman, executive chairman of Newzulu, spoke about the issues with putting free content on social media. “Giving content away for free on social media isn’t a business model. It’s a bankruptcy model,” Hartman said. Newzulu is a worldwide news platform that has a community of more than 100,000 professional and citizen journalists. Newzulu strives to help valuable citizen-captured media find distribution — and payment — from the many established news organizations that use the service. Newzulu uses human and algorithmic components to verify sources before they get published. After the panel, Hartman said the greatest skill a journalist can have is to be aware of emerging technology and to be able to value one’s content in a world where so much is given away for free. Freelance journalist Lyra McKee emphasized her passion for investigative journalism, which is the reason why she is working to complete her novel about Reverend Robert Bradford, who was killed in 1981. Bradford was an Irish politician who was assassinated during the civil war in Northern Ireland. McKee went on to discuss how crowdfunding has assisted in the monetary process of her novel and how sites like “Beacon Reader” are exceptional options to gain support from loyal followers. She also added that if “people give money for the story, then I could publish a chapter a month from my novel.” In 14 months, McKee has been able to raise £6,050 for her writing project, which is due out sometime in 2016. Hayley Jamil is a senior creative media production major at the University of Oklahoma from Miami, Oklahoma. She starts a videographer position with a public relations and advertising agency, Lindsey & Asp, this Fall. M’ary Miller is a senior at the University of Oklahoma majoring in public relations. She currently resides in Norman, Oklahoma where she is a full-time student. Lydia Farve is a junior at the University of Oklahoma studying public relations with a minor in international studies. She currently works for KIND Snacks in field marketing as a University Ambassador and this past season worked for the NBA Oklahoma City Thunder’s Events Crew. Candace Hinnergardt is studying public relations at the University of Oklahoma. She is originally from Bartlesville, Oklahoma. Recently, she wrapped up an internship with the University of Oklahoma Intercollegiate Athletics Department and will begin her next venture in PR at VisitNorman in Norman, Oklahoma. Brigette Waltermire, Anna Reisman, Nicholas Masopust, Ali Stratton and Erin Donnelly also contributed to the piece.